William Shrewsbury Sharpe was the son of Mrs Elizabeth Sharpe of 47 Upper Regent Street, but was fostered by the Shrewsbury family. Always known as Billy he attended the Nether Street School and joined the Boys Brigade, where he learned his love of music, later being a member of the Beeston Old Boys Band. Billy was employed at the local Co-operative Stores. He was later a member of the Nottingham University Constitution for extra study, after he had been a keen participant of the Educational Classes after work at the Boys Brigade. He was quite a wit and also took part in all forms of card games, having a reputation for being very lucky. Billy enlisted at a Recruiting Centre in Nottingham and, with Percy Bettle and Albert Sibley, becoming part of the newly formed 2nd /7th Battalion, Sherwood Foresters. The battalion had been raised during the Boer War but was abolished when the Territorial Forces Act came into force in April 1908; consequently, when the Great War broke out, there was only one Battalion and this became the 1st/7th Battalion Sherwood Foresters known locally as the "Robin Hoods". Orders were received soon after the outbreak of war that a Second Line Battalion was to reform as a reserve and to reinforce the first line casualties when necessary. The North Midland Division was thus formed in late August 1914, with the 178th Infantry Brigade becoming part of the Division comprising the 5th, 6th, 7th and 8th second line battalions of the Sherwood Foresters. The first new recruit for the 2nd /7th Battalion was enlisted on 14th September 1914. After raising the second line battalions the men were billeted in Nottingham and surrounds, with the local lads in their homes until the end of January 1915. Training was limited to drill, and elementary tactical exercises. On the 30th January 1915, orders were received that the 178th Brigade was to proceed to it's War Station at Luton in Bedfordshire. After arriving in Luton Hoo the battalion took part in more advance training and took part in Brigade operations with a lot of route marches. Training continued throughout the year. In April 1916 Billy Shrewsbury served with the 2nd/7th Battalion in Ireland and, in January 1917, the battalion moved to Fovant, landing at Le Havre on 26th February 1917. 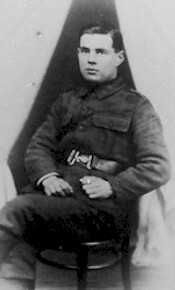 Private Shrewsbury was not long at the front in France, however, before he became the 25th Member of the "Old Boys" to succumb to wounds received during the later stages of action after the Hindenburg Retreat. In March 1917, the German armies on the Somme carried out a strategic withdrawal known as Operation Alberich. They destroyed everything on the ground that they left: flattening villages, poisoning wells, cutting down trees, blowing craters on roads and crossroads, booby-trapping ruins and dugouts. The withdrawal was to an immensely powerful and shorter line, positioned to take every tactical advantage of ground. The construction of this line - or rather, series of lines - had been spotted by British and French aviators in late 1916. British patrols began to detect the withdrawal of German infantry from the Somme in mid February 1917 and a cautious pursuit began, halted only as the Hindenburg Line itself was approached. La Chapelette British & Indian Cemetery - the town of Peronne is approximately 20 kilometres east of Amiens. 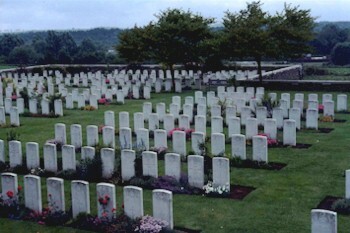 La Chapelette British Cemetery lies a little south of Peronne on the east side of the main road from Peronne to Roye. Peronne town was occupied by British troops on the 18th March 1917, lost on the 23rd March 1918, and regained on the 1st September 1918. The 34th Casualty Clearing Station was at La Chapelette in April-July 1917; the 55th for a short time in April, and the 48th in May; the Lucknow from May 1917, to March 1918; the 53rd and the 12th for short periods in September 1918. In the spring of 1918 the Germans made eleven burials in the two cemeteries; three Italian graves of this period have been removed. There are now 577, 1914-18 war casualties commemorated in this site, 6 of which are unidentified. The cemetery covers an area of 2,937 square metres and is enclosed by a low rubble wall. Can understand Wars and bitter cost. 2It appears that his Service Record has not survived. The majority of these records were lost during a bombing raid during the London Blitz in 1941.